In about 1050, William the Conqueror and Matilda of Flanders were married. Because they were distant cousins, the pope excommunicated them. In 1059 they managed to atone for their sin by each founding an abbey. 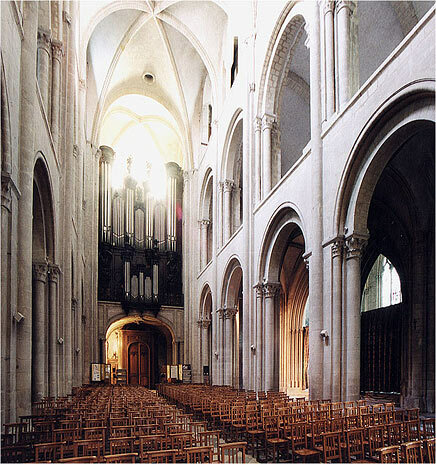 The late 11th century austere Norman Romanesque Church of Saint-Étienne, at the Abbaye-aux-Hommes [on the east side of Caen], was founded by William. His tomb is located there. The abbey is a beautiful structure done in the Norman Romanesque style, and both were constructed of Caen stone, a light creamy-yellow Jurassic limestone. This stone was also a popular building material with the Normans in England.